Given enough time and resources, a skilled attacker will always find a way in. So how do companies deal with this? Companies need to have an Incident Response Program (IRP) in place. A successful IRP is required to bring the needed resources together in an organized manner to detect and deal with an adverse event related to the safety and security of personnel, systems, and data. An IRP should also be tested thoroughly to evaluate an organization’s response to incidents that occur in their environment. We will discuss IRP in more detail in a future blog. No one product or products alone can stop innovative human attackers who can evolve as the need arises, altering tactics and developing increasing levels of sophistication. In the current threat environment, rapid communication of threat information is the key to quickly detecting, responding and containing targeted attacks. 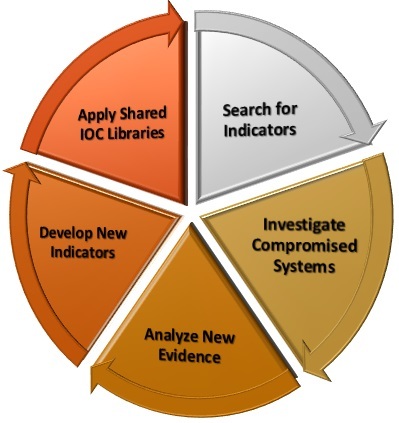 Hunting for Indicators of Compromise (IOCs) is an effective way to combat advanced attackers. IOCs are forensic artifacts of an intrusion that can be identified on a host or network. All of these items can provide early indications of bad actors, and help you identify and contain security incidents before they result in loss. Though not present in all incident response scenarios, IOCs are present more often than not should the security analyst have the cycles and opportunity to learn where and how to identify them. The ability for a security analyst, incident responder or threat researcher to collect, record and notate IOCs in a detailed manner is a critical success factor. Indicators start with simply looking for signature of specific artifacts. These can be the traditional forensic artifacts such as MD5 checksums, compile times, file size, name, path locations, registry keys, and so on. Many different types of specific indicators can be combined together in one IOC, so that any of several sets of signatures of differing types of complexity could apply within one particular IOC. Combining these together in various combinations to provide better matching and less false positives than searches for individual artifacts. The IOC is expensive for the attacker to evade. In other words, to evade the IOC the attacker has to drastically change tactics, tools, or approach. There are also several emerging, would be standards for what has previously been an ad-hoc at worst and organizational at best approach to developing IOCs. In future series we will go into greater detail about how to develop and leverage IOCs together with emerging tools as well as discuss the emerging standards and R&D performed by CyBox (cybox.mitre.org), OpenIOC (openioc.org), and IODEF (IETF RFC 5070). In APT Detection Indicators – Part 2 we will present recognizable attributes and patterns that can be monitored by readily available, open source tools. 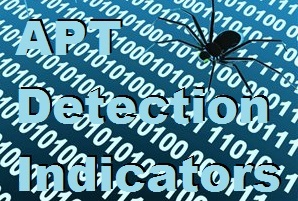 These tools can enable early detection of APT behavior, especially by monitoring unusual inter-zone or outbound traffic.